At the apparent request of lawyers upset with overcrowding, the Supreme Court (SC) has prohibited law students and interns who are not enrolled as advocates from entering the apex court on Mondays and Fridays – so-called miscellaneous days. It is understood that on 15 August SCBA president MN Krishnamani had told Chief Justice of India (CJI) P Sathasivam that the crowds in and around courtrooms on miscellaneous days were a hurdle to advocates needing entry to the courtrooms or in walking through the court corridors, and that lawyers in court felt that the situation was worsened with the additional presence of law students and interns. The SC registry and Krishnamani could not be reached for comment at the time of going to press, but Krishnamani’s assistant confirmed the development. 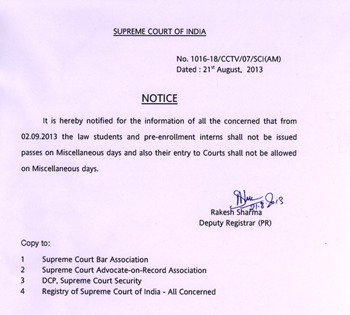 Miscellaneous days – Mondays and Fridays at the Supreme Court of India – are the days that the SC has reserved for admission of matters. The pendency of matters in the SC at the end of July 2013 was 67,964 out of which 56 per cent were admission matters. Legally India Supreme Court postcard writer Courtwitness has written how between 25 to 30 judges, spread over 12 to 14 courtrooms, attempt to dispose of 700 to 1,000 cases in about four to five hours of hearing on typical miscellaneous days. In February seniors Shanti Bhushan and Rajeev Dhawan had also complained about overcrowding in the Supreme Court remarking that old lawyers stood to be “crushed to death” and that Dhawan had broken a leg because of the crowds. this was long overdue. there is surely - "more learning" -with being involved in final hearing matters, drafting petitions, replies etc. (over pulling off all-nighers only to prepare a list of dates for a researched misc brief - a rather brain dead exercise). there should, likewise, be a way to make younger counsels get involved with more meaningful work (over becoming full time "pass over lawyers") - a new breed of counsels ("juniors") who overstay their tenure at chambers and have become very comfortable there - seeking pass overs and adjournments; or otherwise enjoying beverages at some canteen ! our SCBA should also urge sr advs to take in graduates with (a) some experience;(b) who are reasonably sure about becoming arguing counsels, eventually; and (c) who have a defined path (and period)for branching out to start an independent practice. the sr lawyers of our time are (by and large) not addressing these real issues with adequate sincerity. it is the duty the mentor and various bar associations that presently exist to really counsel young lawyers (who wish to be helped) and give them support and direction. Maybe the SCBA should urge Sr. Counsels to treat their juniors better and pay them! Well doing something mechanically, and getting something actually done are different, don't you think? SCBA is quite useless unless it concerns the interests of the senior members of the bar. The juniors are happy to get a diary and a tie as an annual pat on the back. ha ha ha, "pass-over lawyers", aptly said! Having observed a lot of friends who are litigating, seems it makes more sense to start your career in lit from the trial court level. In any case it makes no sense to start it directly at the SC level. At the SC, you would perhaps be living in a fool's paradise that you are working at the SC under some fancy senior counsel,where your senior would never let you argue. All you would do is taking pass overs and adjournments. Of course you would do research and preparing briefs and all, but that you do even at a litigation law firm. The reason you opt for working under a practicing senior is that you actually want to experience first hand court room action. Also, at the apex court level, you mostly focus on the substantive law aspect, which, with you constant research, keeping updated by being well read, you can any always keep learning on your own. Procedural law, is something you would learn only by practicing it on a regular basis at the lower court level. Also when you leave your senior at some point to start independently, you are, if at all, more likely to get briefs at the lower courts than at the higher courts. Hardly anyone (infact no one) would want to engage you to argue at the SC. and here I thought that we were free to watch court proceedings!!! That you are but from Tuesday to Thursday. yeah... very well done... Just kill the patient. The disease, on its own, is harmless, rt? ..and how exactly is a law student supposed to get interested in litigation or decide whether its the best career path? By watching Court TV? Misc days are really not that educational unless you want to learn how to throw a file with the flick of ur wrist. Actually I think it is one of the most important. Helps you appreciate the importance of a well written draft, with judges having made up their mind before the hearing. It also helps you understand what clicks and what does not, in the one minute that you have to convince th judge. So..